I was fortunate enough to demo the experience in Long Beach a few weeks ago and was stunned at its depth. Inside the virtual world, you’re able to cycle between every car in the field, lowering yourself into the driver’s view to see what it’s actually like to drive around the streets of Long Beach. You can also watch from almost any point on the track, including marshal’s posts and photo holes. Even the paddock is open and the surrounding area is filled with detail as well. The drivers were eager to give it a go (here’s a video of Nelson Piquet, Jr. walking into Sam Bird) and Alejandro Agog, CEO of Formula E, was also impressed. I’ve interviewed Will Winston and Dilan Shah of Virtually Live to find out more about who they are and how this will transform the way races are experienced in the future. 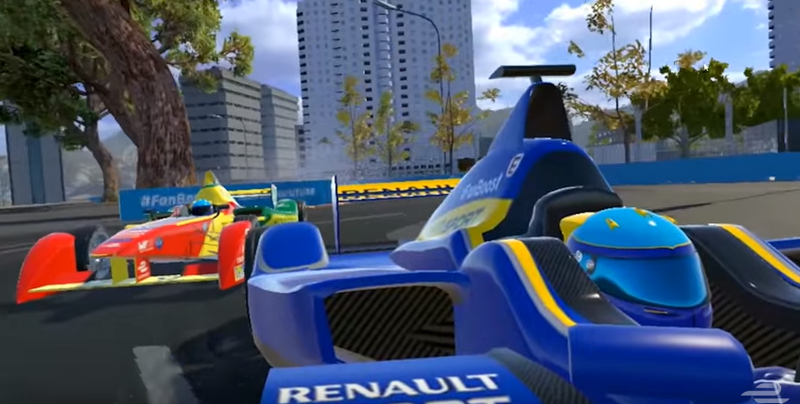 Both Formula E and Virtually Live are innovators, but who showed initial interest in this project? We showed initial interest based on how forward thinking Formula E is. After they tried a demo the feeling was mutual. Has Virtually Live ever worked on something of this scale before? Are there any big names helping on this project? We’ve worked with the Scottish Professional Football League (SPFL) to recreate soccer matches, but this is our first foray into motor racing. For soccer we work with STATS to provide us the appropriate data, but for Formula E we use the GPS location data they have internally. How detailed and realistic is the experience? How far can the capabilities go? The experience is designed to feel as real as possible while providing features you can’t get in real life. We recreate the tracks exactly through CAD drawings and satellite coordinates. Due to computing power, the experience feels like a high quality live video game, but as computers get stronger, the end goal is to create a photo realistic experience. We’ve seen CGI integrated into film to convey realism, and we think there’s a place for it to experience sports in VR. It’s a unique way to interact with the sport and friends in realtime. In the future we can incorporate photo scanned avatars or 3D representations into the environment so people can come together and watch the sport regardless of location. How will fans be able to watch the race with their friends? Fans will be able to talk via text and voice chat as the race is happening. It’s ideal for people who are separated geographically but want to watch together. Once the tech improves, we will experiment with bringing 3D representations of people into the environment so you can actually see your friends. In addition to changing how fans experience the race, how could this revolutionize the way races are covered on TV? You might see a first person perspective more frequently. As camera technology becomes more nimble, that will be possible. Will teams and drivers also be able to use it to their advantage and learn from the strengths of their competitors? Sometimes you can learn faster/better by experience. Drivers can go back and watch the race from their competitor’s perspective, which they’ve never been able to do before. It’s possible they could learn more about their tendencies this way. What does the timetable look like for the full release and how will fans be able to get their hands on this? We’re still in development but we’d like to have at least one live race before the end of the series. It’s a closed trial for now, but we’ll be publishing historical races for fans to experience retroactively. Formula E markets itself as a forward-thinking series and this innovation is something many will be keen to try out as it becomes more available. Thanks to Will and Dilan from Virtually Live for taking time to answer my questions. You can follow them on Twitter, here and Facebook, here. You can follow me on Twitter @dannycatsteve and Formula E’s USA Fan Site a like, here. Header photo taken from in-engine footage found in this video.